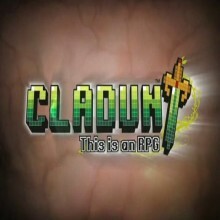 ClaDun – This is an RPG! is an action RPG that’s both new and old! ClaDun – This is an RPG! brings action RPG gameplay to the PSP, in what could quite possibly be one of the most unique stories ever seen. You follow Pudding, on her ever important quest to find lots, and lots of treasure, and her friend Souma, who does his best to protect her. The cast of characters that you meet is wide and varied, from the extremely unlucky Coco to the swords woman Sunday, to the extremely stylish wizard Bob, the characters all have their own personalities and quirks, and they’re pretty interesting to boot. The story is continuously told after the completion of a few (one or two) dungeons, and after each dungeon a new dungeon is unlocked. Each dungeon is different from the last, although the main goal is simple, get to the end. However, to get to the end you must beat monsters, avoid traps, and use your head. Beating every monster in each level is certainly possible, but takes a long time. Why does this matter? Well, every level has its own target time, similar to Half Minute Hero, and if you beat the target time, you gain fame points which allow you to buy better weapons and armor in the shop as you gain fame levels. There is a trick to each level, whether it’s a certain pattern or just a handful of specific monsters that you need to defeat, and it might (will, even) take you a few tries before you get the hang of it. The main thing of the game is the Magic Circle spell. It allows you to use any characters that you have in your party to act as your current HP when you get attacked from any direction, depending on the circle’s layout. Character growth differs on level depending on if they’re the main character or the sub character, so it’s important to cycle them out. Each class learns different circles and moves, and they all have different stat allocation as well. The elemental aspect of the game is important as well, fire monsters take extra damage from ice attacks and vice versa, and piercing attacks work well when you’re on fire and have to damage a fire monster, or frozen and have to damage an ice monster. There is a HUGE variety of weapons and armor and artifacts, which leads to the next topic, the artifact system. Each magic circle has space for artifacts, which can increase your attack or defense, make you move faster, make special moves cost less, there is a huge variety of things you can do with them. They are a CRUCIAL part of the game, and the way they work is as follows. Some artifacts are free, but others take mana. The difference between SP and mana is that mana is used for artifacts, and SP is used for special moves while in combat. There are artifacts that effect the artifacts around them and if put in one of the “ability” artifact spots, will change how the ability itself works. Decent artifact composition can mean the difference between beating a level in 30 seconds (out of a minute) or not being able to complete it at all. The whole sandboxiness of this game is pretty awesome, but it is definitely repetitive. However, the story makes up for it and the game itself is definitely fun. I only wish there were more classes, honestly. On a last note, the music is absolutely amazing. If you miss the feel of old school, 8-bit era music, choose the 8-bit music when you get the chance. It is incredible and you will NOT be disappointed. The modern music is also exceptionally strong, and the overall soundtrack works perfectly with the game. All in all, definitely check this game out, as it’s a strong entry in the PSP catalog and you won’t be let down by it. It’s the kind of game you can play for hours, or just for 5-10 minutes on a break of some sort, and pick it up again later and have just as much fun.